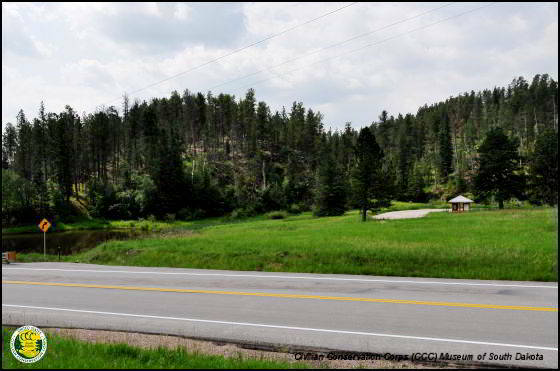 Camp F-9 (Hill City) was located about 4 miles northwest of Hill City, probably along road 17 near Newton Lake. It contained six 20 x 100-ft buildings when first occupied by the CCC. During 1933 16 more buildings were erected (1934). A pond was constructed in 1934 t o be used for ice skating and swimming (1935). 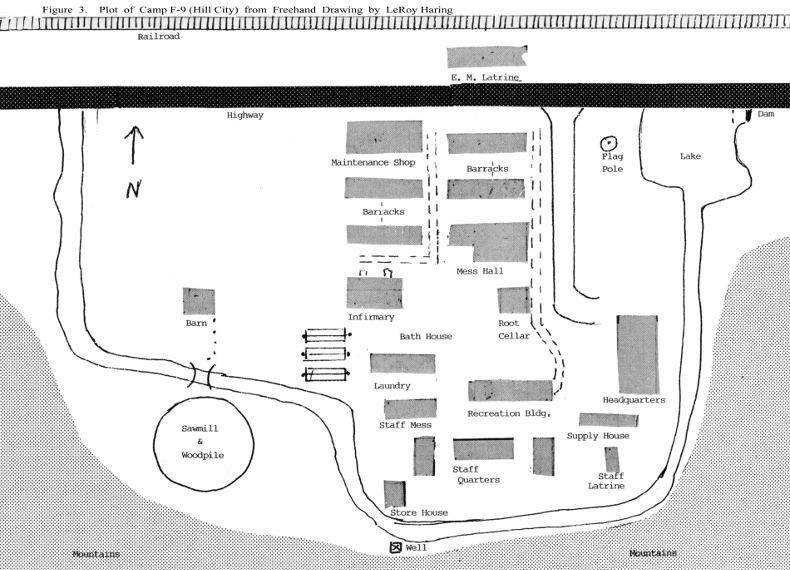 A rough plot of the camp, drawn by Leroy Haring who was an enrollee in Camp F-9 during the first 10 months of its existence, indicates that the camp was south of the Deerfield road. The road paralleled the south side of a railroad in an east-west direction. A short distance west of camp a south flowing creek crossed the road, then looped around the sides of camp--at the foot of a mountain or mountains along the south side. 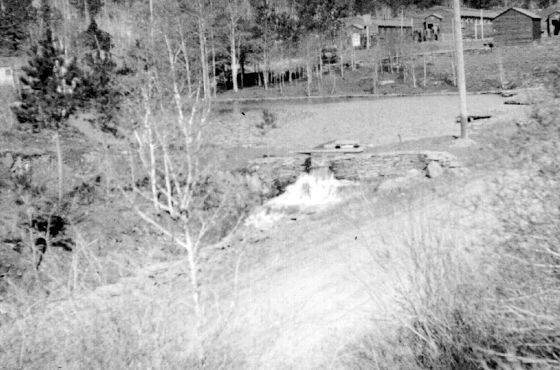 Near the northeast corner of camp a small dam was built on the creek--shortly before it reached the Deerfield road--creating the pond that was used for skating and swimming. 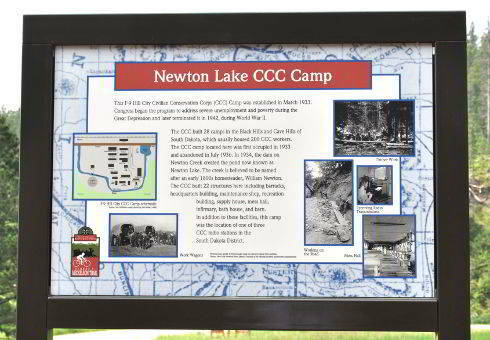 It was first occupied by a CCC company in June 1933 and was discontinued as a CCC camp in July 1936. Company 793 was the only company to be stationed at Camp F-9 (Hill City). It was organized at Fort Meade May 20, 1933. The company commander, three non-commissioned officers, and a private from F Troop, 4th Cavalry were assigned to the company (1934). From the first group of men, all from Aberdeen, cooks and clerks necessary to start organizing the company were selected (1934). On May 22 another 55 men arrived from Aberdeen. 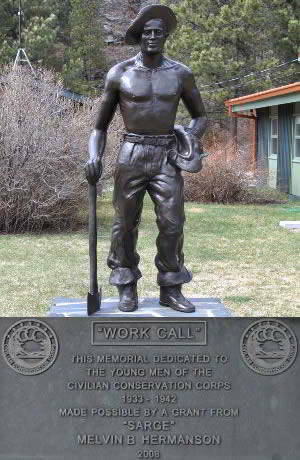 On May 23, 72 more men were received from Mitchell, making the company strength 160. On May 26 four men were transferred from the company to Headquarters Company, and on June 1 six were transferred to Company 792 (1934).